In 1820, Hans Christian Oersted discovered the needle of a compass would deflect when placed next to a wire carrying an electric current. It took 15 years for the first electric motor to be invented following this observation. Humans are dumb, but perhaps they wouldn’t be so oblivious to the basic facts of our reality if they could see magnetic fields. Or if they just had a 3D printer. For his Hackaday Prize entry, [Ted Yapo] is doing just this: adding a magnetic field scanner to a 3D printer, allowing for the visualization of magnetic fields in three dimensions. The device [Ted] is working on is actually extremely simple, and is mostly implemented in software. The hardware is just a 3D printer with a toolhead consisting of a HMC5883L magnetometer breakout board. This is the simplest and easiest way to find the direction and intensity of a magnetic field, the rest of the work is done in software. Right now, [Ted] has a setup that will scan a 3D volume with a printer. By placing a magnet in the middle of the print bed, he can visualize the magnetic field inside the volume of his 3D printer. It’s a visualization that is vastly superior to a compass, ferrofluid, or even a mess of iron filings, and is surely a much better pedagogical apparatus for classrooms and science museums alike. If you have ever wondered what it took to make your own custom graphic LCD from scratch, this video from [Applied Science] is worth a watch. It’s concise and to the point, while still telling you what you need to know should you be interested in rolling your own. There is also a related video which goes into much more detail about experimenting with LCD technology. [Mark Gibson] probably has nothing against silicon. He just knows that a lot that can be done with simple switches, relays, and solenoids and wants to share that knowledge with the world. This was made abundantly clear to me during repeat visits to his expansive booth at Denver Mini Maker Faire last weekend. In the sunlight-filled atrium of the Museum of Nature and Science, [Mark] sat behind several long tables covered with his creations made from mid-century pinball machines. There are about two dozen pieces in his interactive exhibit, which made its debut at the first-ever Northern Colorado Maker Faire in 2013. [Mark] was motivated to build these boards because he wanted to get people interested in the way things work through interaction and discovery of pinball mechanisms. Most of the pieces he has built are single units and simple systems from pinball machines—flippers, chime units, targets, bumpers, and so on—that he affixed to wooden boards so that people can explore them without breaking anything. All of the units are operated using large and inviting push buttons that have been screwed down tight. Each of the systems also has a display card with an engineering drawing of the mechanism and a short explanation of how it works. [Mark] also brought some of the original games he has created by combining several systems from different machines, like a horse derby and a baseball game. Both of these were built with education in mind; all of the guts including the original fabric-wrapped wires are prominently displayed. The derby game wasn’t working, but I managed to load the bases and get a grand slam in the baseball game. Probably couldn’t do that again in a million summers. Take me out to the Maker Faire! Click to embiggen. 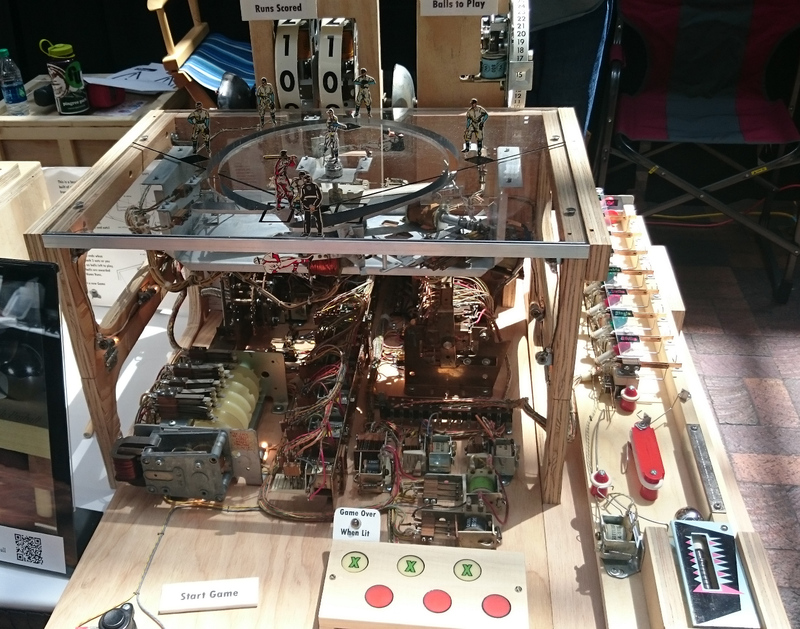 About five years ago, we covered [Mark]’s build of an atomic clock from pinball machine parts. It’s about time we featured his work again. We have shared a lot of pinball-related builds over the years from the immersive to the gigantic to the dankest of the dank. A corollary to Godwin’s Law ought to be that any Hackaday post that mentions Nikola Tesla will have a long and colorful comment thread. We hope this one does too, but with any luck it’ll concentrate on the engineering behind this tiny custom-built Telsa turbine. For those not familiar with Mr. Tesla’s favorite invention, the turbine is a super-efficient design that has no blades, relying instead on smooth, closely spaced discs that get dragged along by the friction of a moving fluid. [johnnyq90]’s micro version of the turbine is a very accomplished feat of machining. Although at first the build appears a bit janky, as it progresses we see some real craftsmanship – if you ever doubt that soda can aluminum can be turned, watch the video below. The precision 25mm rotor goes into a CNC machined aluminum housing; the way the turned cover snaps onto the housing is oddly satisfying. It looks like the only off-the-shelf parts are the rotor bearings; everything else is scratch-made. The second video ends with a test spool-up that sounds pretty good. We can’t wait for part 3 to find out how fast this turbine can turn. Size matters, and in this case, small is pretty darn impressive. For a larger treatment of a Tesla turbine, see this one made of old hard drive platters. There’s a gritty feel to the Hackerboat project. It doesn’t have slick and polished marketing, people lined up with bags of money to get in on the ground floor, or a flashy name (which I’ll get to in a bit). What it does have is a dedicated team of hackers who are building prototypes to solve some really big challenges. Operating on the ocean is tough on equipment, especially so with electronics. Time and tenacity has carried this team and their project far. Ask Hackaday: Whatever Happened to LED Light Sensors? If you’re a long-time Hackaday reader like we are, you’ll certainly remember a rash of projects from around ten years ago that all (mis-)used an LED as a light sensor. The idea wasn’t new, but somehow it made the rounds and insinuated itself into our collective minds. Around the same time, a cryptographic cipher with an exceptionally small memory footprint was also showing up in hacker projects: TEA (Tiny Encryption Algorithm). This old project by [Marcin Bojanczyk], [Chris Danis], and [Brian Rogan] combines both the LED-as-light-sensor meme and TEA to make a door-entry keyfob that works over visible light. And they do so using almost nothing — a few LEDs and just over 2Kb of code. It’s pretty sweet. Which brings us to the question: where are they (LED-sensors and TEA) now? LED-as-light-sensor was just cool. We certainly loved the idea back in 2006. But [Forrest Mims] had been using the phenomenon for decades back then. It certainly makes sense when you’re trying to squeeze as much as possible out of as little as possible, or when budget is a main concern and you just can’t afford an extra photodiode. 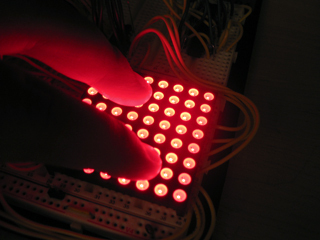 But our own experience with LEDs as light sensors is that the results are extremely variable across different LEDs. Code that works with water-clear red LEDs might not work with the ones that come in red-tinted plastic, for instance. Is that why they went extinct? Similarly, the TEA family of ciphers showed up in a bunch of projects around this time, from the badge for the HOPE conference in 2010 to a widely used RFM12B radio library. There are a couple of attacks on XXTEA, but they only affect reduced-round versions of the cipher, and rely on a tremendous amount of intercepted data — more than we’d see in a home-automation network over years. Over the last five years or so, there’s been a lot more Internet of Things, which means using standard Internet-style encryption methods (AES and so on) that are widespread on non-memory-constrained computers. Is that what happened to XXTEA? Anyway, we got tipped off to a project that combined a few of our favorite (old) ideas in one, so we thought that we’d share. Thanks [Blue Smoke] for the walk down memory lane. Any of you out there keeping the flame(s) alive? Have you used sensing LEDs or XXTEA? Are those projects still going, or do you have any future projects planned with these tricks still up your sleeve? Let us know in the comments below. [Neumi] wrote in with a sweet robotics hack. 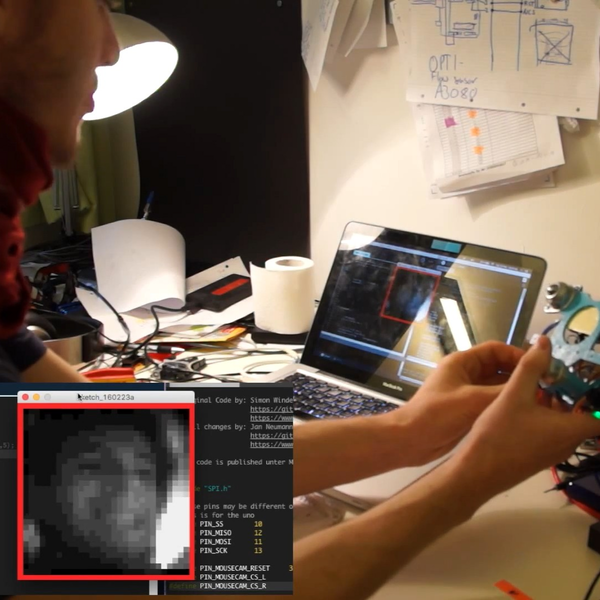 It’s a 2D laser distance sensor (YouTube) made with a cheap line laser and an optical mouse’s flow-sensor chip used as a low-resolution camera. In one sense, it’s a standard laser-distance-sensor project. But it is clever for a whole bunch of reasons. For one, using a mouse sensor as a low-res camera is awesome. It’s designed to read from a standard red LED, so the sensitivity is in just the right ballpark for use with a line laser. It returns a 30×30 pixel greyscale image, which is just about the right amount of data for a low-end microcontroller to handle and keep up with the framerate without resorting to coding tricks. It’s also no coincidence that these sensors are available with lenses built in, for relatively cheap, on eBay. Apparently the quadcopter gurus use them as if they were mice to visually track their quad’s motion. Hacker spillover! Detecting the laser line as it reflects off of whatever objects are lying on [Neumi]’s floor could also possibly prove difficult, and might produce false readings in the presence of background illumination. So [Neumi] takes two readings with the camera — one with the laser on and one with it off — and differences them. Done fast enough, this should reduce any non-laser sources down to the sensor’s noise floor. Finally, there’s some thresholding and averaging going on behind the scenes that help make everything work out right. The code is up on GitHub. Not a bad build for a 2D laser distance system on a budget. If you want to shell out a bit more money, and are into a seriously involved build, this is probably the slickest we’ve seen in a long time. And if you’re thinking that you’ve heard of [Neumi] before, you’re right: we featured this 405mm laser PCB exposer / burner CNC machine just a few months ago.